All other areas please contact Colin Edgar. 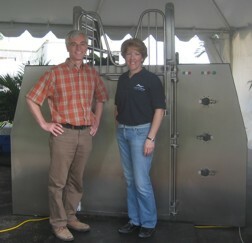 Colin Edgar and Donna Marki demonstrate the 2006 Model of the Premier CET Equine Spa at World Equestrian Festival being held at the International Polo Grounds in West Palm Beach, Florida. Would you like to set up your own Equine Hydrotherapy Centre and distribute CET Equine Spas within your designated territory? Or do you currently sell high value equestrian equipment to the horse industry and wish to add additional prestige lines to your range? If you want to set up an equine spa therapy centre, ideally you would already be involved in the horse industry and have suitable premises and stabling. Distribution arrangements would vary according to the size of the country and likely demand. Should you be interested in discussing the possibilities of becoming a distributor for the CET Equine Spa please e-mail CET Limited giving your contact details and information on your current business activities.